12:11 am. 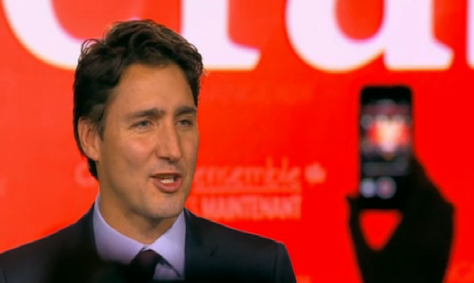 Justin Trudeau, Canada’s new prime minister, is set to take the stage for his victory speech. 12:08 pm. 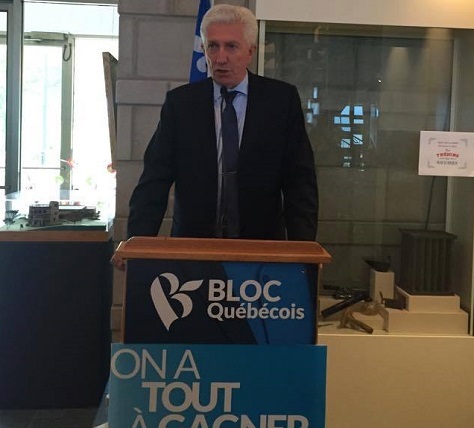 In Laurier-Sainte-Marie, the NDP’s Hélène Laverdière will hold onto the riding, a defeat for the Bloc’s leader Gilles Duceppe (pictured above), almost certainly spelling the end of his political career (and his short-lived comeback). That could complicate efforts for the Bloc’s future resilience, despite the fact that the party is set to win 10 seats in the province. 12:00 am. Harper brags that the part has a national base, including in Quebec, and that his government leaves Canada in a stronger and safer position after nine years of Conservative governance. 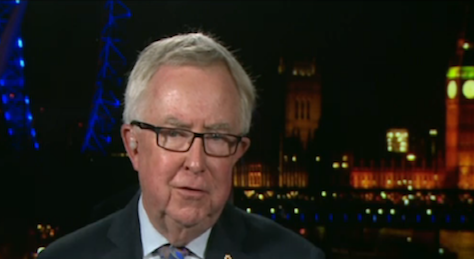 No direct remarks that he will step down as leader, but he has delivered a written statement that he will do so, asking the Conservative Party to appoint an interim leader prior to a full leadership contest. 11:56 pm. Harper says he has ‘no regrets,’ but accepts without hesitation that the Liberals have won, and he offers Justin Trudeau congratulations and full cooperation in the days ahead. 11:54 pm. 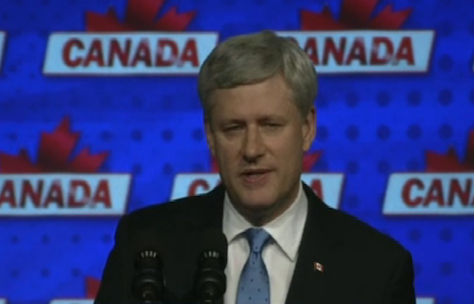 Harper is now taking the stage in Calgary. 11:52 pm. 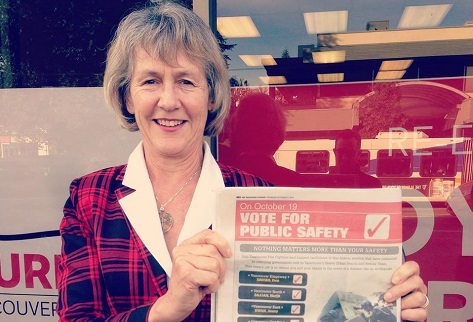 The hopes of the Green Party to make a gain in Victoria are dashed, with the NDP’s Murray Rankin holding on against the Green candidate Jo-Ann Roberts. 11:31 pm. Thomas Mulcair, the leader of the NDP is delivering his concession in Montreal, both in French and in English. It’s becoming increasingly clear that Mulcair will hold off a challenge from Liberal attorney Rachel Bendayan in his riding of Outremont, and Mulcair did not announce that he would be stepping down as leader. 11:23 pm. In Etobicoke Centre, Liberal candidate Borys Wrzesnewskyj has easily defeated Conservative MP Ted Opitz by a double-digit margin. The significance here is about Ontario’s politics and, more importantly, Toronto’s politics. 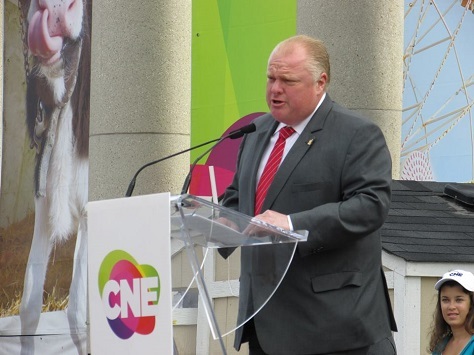 Etobicoke is home to Rob Ford (pictured above), the former Toronto mayor and currently a member of the Toronto City Council. That ‘Ford Nation’ couldn’t deliver Etobioke to the Conservatives shows that the Ford moment in Toronto’s politics may be over. 11:18 pm. 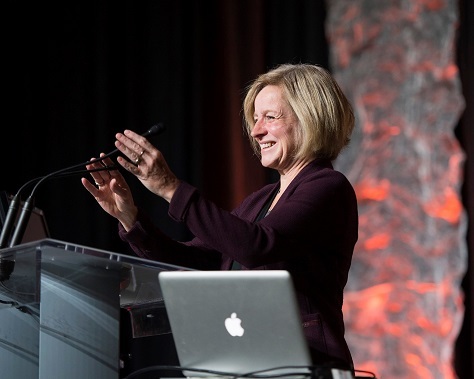 Rachel Notley (pictured above), the NDP premier of Alberta, will be somewhat embarrassed by her federal party’s failure to pick up any seats, though Linda Duncan will hold her riding in Edmonton Strathcona. But the NDP fell far short of its targets for pickups in Edmonton Centre (still a toss-up between Liberals and Conservatives) and Edmonton Griesbach, which looks like a Conservative hold. To add insult to injury, in Calgary Skyview, popular Liberal Party provincial legislator Darshan Kang seems set to pick up a seat for the Liberals. 11:05 pm. In and around Winnipeg, the Liberals have taken seven of Manitoba’s 14 ridings, including Winnipeg Centre, where Pat Martin is losing to Robert-Falcon Ouellette, an indigenous politician, after holding the seat since 1997. Jim Carr, a former deputy leader of the Manitoba Liberal Party and the CEO of the Business Council of Manitoba, will take Winnipeg South Centre. 10:52 pm. The Liberals are obviously taking Québec by storm tonight. 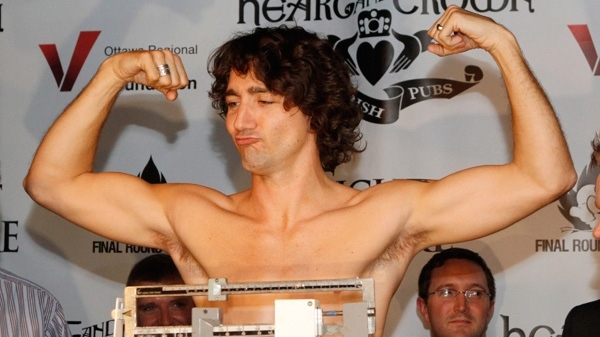 The last time that a Liberal leader won a majority of the seats in Québec? In 1980, when Trudeau’s father, Pierre Trudeau, won 74 out of 75 ridings. Throughout the 1990s, it was the Bloc that won the most seats, despite the fact that both prime ministers Jean Chrétien and Paul Martin came from the province. The Conservatives, notably, have won nine seats, mostly in and around Québec City — that’s actually an increase from the 2011 election. The Bloc is leading in 10 seats, which is still a decent showing for a separatist movement left for dead. The NDP, leading in 12 seats, still holds more seats than any other party, excepting the Liberals. 10:46 pm. In Ottawa West-Nepean, Liberal Anita Vandernbeld easily defeated Abdul Abdi, the Conservative candidate. This is the riding that John Baird, formerly Conservative foreign affairs minister, held. 10:38 pm. CBC has now declared that the Liberal Party, under prime minister-elect Justin Trudeau, will win a majority government. 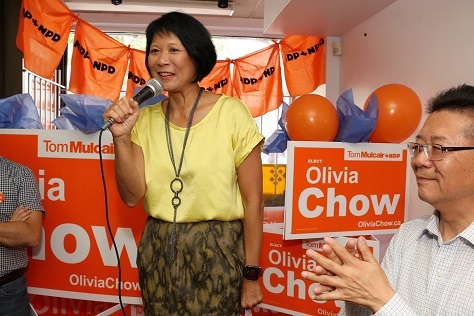 10:35 pm: In Spadina-Fort York, former MP Olivia Chow (pictured above), the widow of the late NDP leader Jack Layton, who died months after the 2011 election, has been defeated in a blowout result — less than a year after losing the Toronto mayoral election. While the Conservatives appear to have done fairly well in southwestern Ontario and suburban Toronto, the Liberals are dominating southeastern Ontario and downtown Toronto. The NDP, except for a handful of northern rural seats, were crushed out. 10:26 pm. 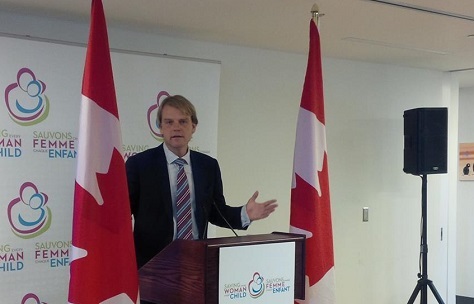 In the Ajax riding, in the suburbs of Toronto, Conservative minister of citizenship and immigration Chris Alexander (pictured above) has lost his seat to Mark Holland, who represented Ajax from 2004 to 2011. 10:21 pm. The NDP is now leading or elected in just 24 seats, far below the 103 ridings that it won in 2011. It’s clear that Québec’s voters have slipped away. Mulcair faces a tough battle in his own riding in Outremont — a staggering result for a party that led national polls as recently as mid-September. It’s still early, and there’s almost certainly hope that the NDP will pick up some seats in Edmonton’s urban ridings in Alberta (where Rachel Notley recently won the NDP’s first-ever provincial government) and in British Columbia, where the NDP’s support was strongest heading into the election. 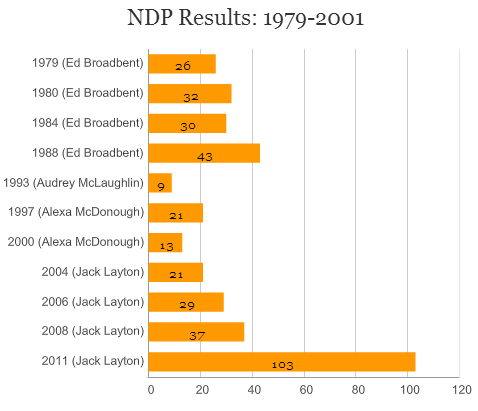 Despite the disappointment, if the NDP makes it to just 44 seats, which is not at all implausible, it will still be the second-best result in the NDP’s history. That’s little to comfort Mulcair, though, who will have lost over half of his caucus after four years in the official opposition. The ‘Orange Wave’ is over. 10:16 pm. Liberals are now leading or elected in 170 seats, with the Conservatives falling back to 95, the NDP with just 24 and the Bloc with eight. It’s almost certain to be a majority government for Justin Trudeau, on the biggest swing in Canadian electoral history — at 170, it will be a gain of 136 seats, by far the biggest election-on-election gain since Confederation in 1867. 10:04 pm. The Liberals are now leading or elected in 145 ridings. Just 25 short of a majority. 10:00 pm. Polls are now closing in British Columbia. 9:57 pm. Though it’s still early, it’s probably something of a disappointment that the separatist Bloc québécois is leading in just three ridings. Gilles Duceppe, who led the party to four consecutive victories in Québec in the 1997, 2000, 2004, 2006 and 2008 elections. After losing his seat in the 2011 defeat, Duceppe stepped down as leader — but he returned in June 2015 as something of the last hope of the party. If it fails to win any seats, the BQ could become a relic of the past — and it still might face extinction if Duceppe fails to win his own riding in Laurier-Sainte Marie. 9:55 pm. 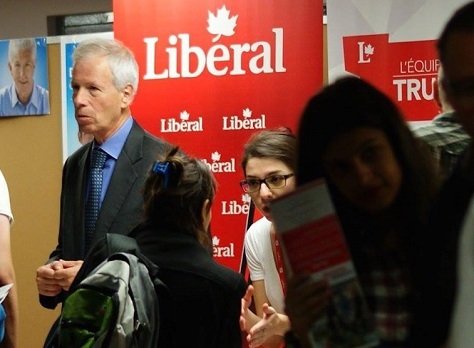 Liberals are now leading or elected in 102 ridings. Easy to believe the party could well be on the way to a majority government. 9:45 pm. Fifteen minutes after polls in 250 ridings started to close, Liberals lead (or have been elected) in 60 seats, Conservatives in 28 and the NDP in just 8. 9:39 pm. CBC is now calling that the next prime minister of Canada will be Justin Trudeau, though it’s too early to know if he will lead a minority government or a majority government. 9:12 pm. Are you ready? 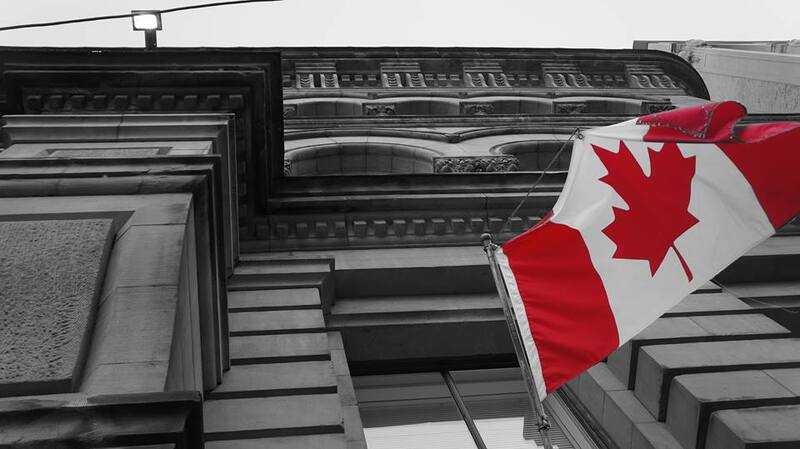 Polls from Ontario, Québec and the prairies to Alberta will close at 9:30 pm ET. It won’t be too much longer before we have a better idea about who will control the next Canadian government. 9:03 pm. 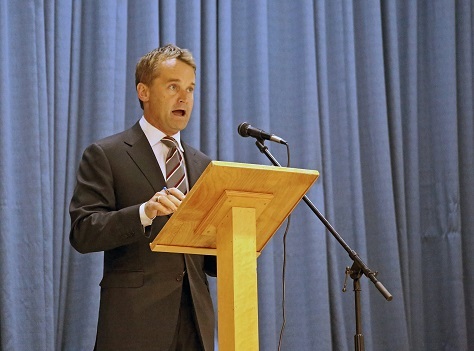 One of the rising stars of any fresh Liberal government will certainly be Seamus O’Regan (pictured above), the newly elected MP from St. John’s South — Mount Pearl. Born in 1971, O’Regan was well-known to Canadians as a journalist for CTV, a national news channel and a co-host of Canada AM, CTV’s morning news show. 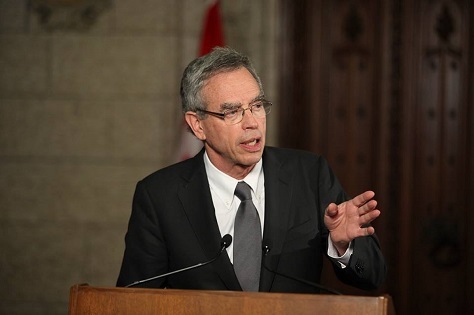 He worked for Jean Charest, when Charest was minister of the environment in the early 1990s (before becoming Progressive Conservative leader and then Quebec’s premier), and he also served as a speechwriter to Brian Tobin, a former Newfoundland premier. So he’ll come to a Liberal government with some important behind-the-scenes experience, and he will be a leading candidate to take on at least a junior ministerial role in any Trudeau cabinet. 8:59 pm. Dominic LeBlanc easily won his seat in Beauséjour — an MP since 2000 and a leadership candidate in 2008, LeBlanc will become one of the most senior Atlantic Canadians in power if the Liberals do enter government. Along with Seamus O’Regan, a rising star from St. John’s, Newfoundland, it’s easy to imagine LeBlanc taking a spot in a Trudeau cabinet. 8:48 pm. 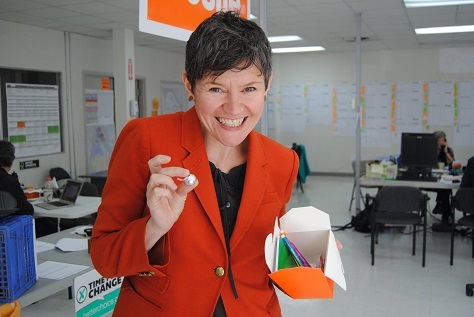 Megan Leslie (pictured above), one of three deputy leaders of the NDP, has lost her seat in Halifax to Liberal Andy Fillmore. It’s a huge blow for the NDP. Leslie has served as Halifax’s MP since 2008 and, even more notably, it was the seat that former NDP leader Alexa McDonough held from 1997 to 2008. 8:33 pm. Liberal candidate Sean Fraser has won the riding of Central Nova, where Peter MacKay is retiring. It’s a staggering loss for the Conservatives — MacKay is a popular former defence and justice minister, and of courser he served as the last leader of the Progressive Conservatives before merging with Harper’s Canadian Alliance. 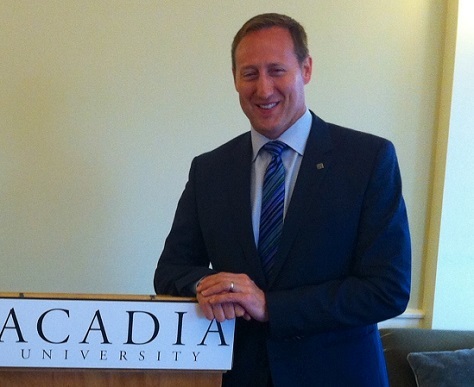 To the extent that MacKay (pictured above) had hopes of succeeding Harper, he certainly has a harder path now. His father, Elmer MacKay held the Central Nova seat between 1971 and 1993 (with a brief exception when Brian Mulroney held the seat after his election as PC leader in 1983). 8:31 pm. In Fredericton, Liberal Matt DeCourcey has defeated Conservative MP Keith Ashfield, a former cabinet member who stepped down after being diagnosed with cancer. 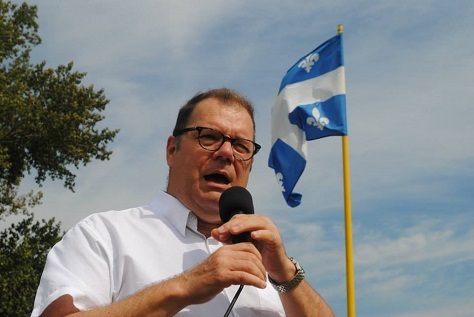 To the extent that New Brunswick’s francophone voters have supported the Liberals, it could be a sign that they will also support the Liberals in Québec as well. 8:22 pm. The last time we saw anything like this in Atlantic Canada was the 1993 election, when the Liberals won 31 of 32 ridings in the region — and that came only because the Progressive Conservatives collapsed (they won just two seats in that election). 8:17 pm. So far, the Liberals are up 35.2% in Atlantic Canada, and the CBC notes that the Liberals are leading or projected to win in all 32 seats in Atlantic Canada. 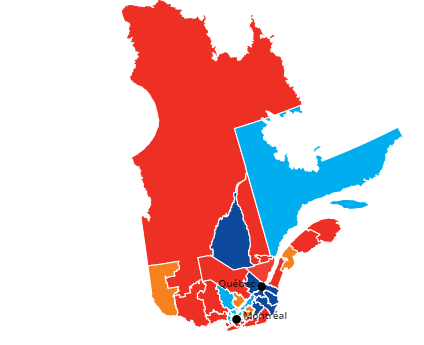 It’s worth noting that the Liberals won just 34 ridings nationwide in the 2011 election. 8:01 pm. In St. John’s South – Mount Pearl, star Liberal candidate Seamus O’Regan, a one-time journalist with CTV, has picked up a seat from the NDP, as Ryan Cleary will lose the riding. The 44-year-old will be one of the rising stars of the Liberal caucus from Atlantic Canada. 7:49 pm. Accordingly to the CBC, the Liberals are winning around 70% of the vote in Atlantic Canada — a huge jump from 2011. That’s a strong omen. But let’s wait to see what the swing is in Québec and in Ontario. 7:32 pm. Three elections have now been declared by CBC for the Liberals in Newfoundland and Labrador. In Bonavista-Burin-Trinity. Judy Foote, the Liberal candidate, has been elected. Nothing, so far, to indicate anything about the direction that Canada will go nationally. 7:27 pm. 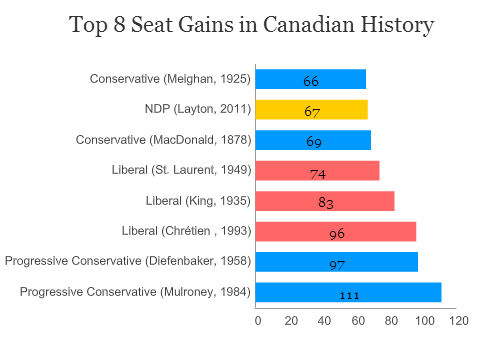 With just 34 seats in the House of Commons, the Liberals are certain to have a historic night in terms of gains. 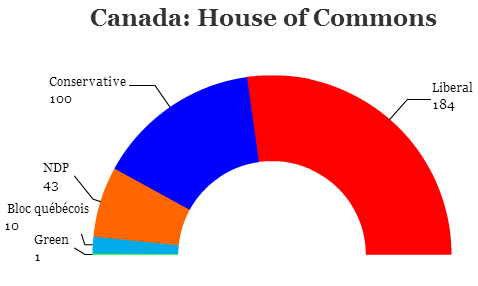 It wouldn’t be surprising to see the Liberals gain triple digits (especially because the new House of Commons will feature 338 seats, not the 308 from the last parliament). As results begin to accelerate, here’s a chart that sets forth the largest gains from election to election in Canadian history. If the Liberals gain 100 seats (an entirely possible outcome, according to polls), it would be the second-greatest improvement in Canadian electoral history. The largest? Brian Mulroney’s wave election in 1984, when the Progressive Conservative Party gained 111 seats. 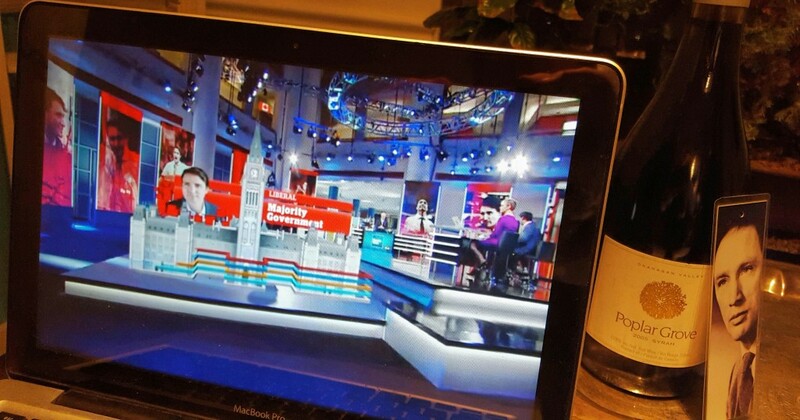 It’s not impossible for Trudeau’s Liberals to surpass that tonight. 7:15 pm. So far, it’s early, but the polls have closed in the seven ridings in Newfoundland and Labrador. It’s too early to call any ridings, but the Liberals are leading in five of the seven seats. Atlantic Canada is a longtime Liberal stronghold, and everyone believes that the Conservatives will lose much of their gains from the 2011 election. So it’s worth cautioning that a strong Liberal start in Atlantic Canada isn’t particularly predictive of the rest of the country. 6:53 pm. As polls close from east to west, here’s a region-by-region breakdown that provides the context of how each region might vote and key ridings to watch. 6:50 pm. If, as polls predict, no government wins a majority (170 seats) in the House of Commons, it seems almost certain that the NDP and the Liberals will join forces to oust Harper. But it won’t be easy. 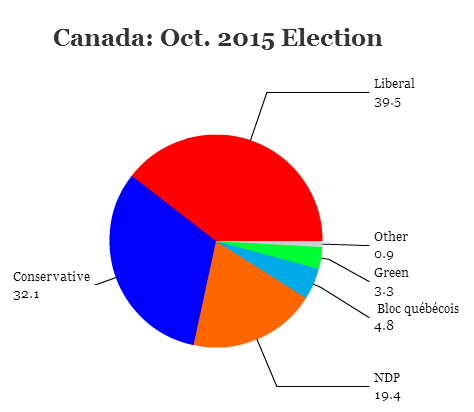 Here’s a look at how a Liberal-NDP coalition might be midwifed. 6:46 pm. With a few minutes before the first polls close in Newfoundland, you can read here about the various oil pipeline projects that Canada’s next government will face — it’s not just about US-Canadian relations and the Keystone XL pipeline.